“…what if we really took time to remember who God is and that His plan isn’t always our immediate gratification?! Why is so hard to accept that His plan is much bigger and more important…our Sanctification? Let me be clear and say that again…God’s plan isn’t your gratification, it’s your sanctification. In our Father’s eyes, our sanctification is MUCH more important with eternity at stake. Wouldn’t you agree? I love Francis Chan refers to our ratios being off. We spend 99% of our time focused on the less than 1% of eternity that we spend on Earth, when really things make whole lot more sense when it’s the opposite. I mean, doesn’t preparing for eternity with the Lord deserve 99% of our attention? What if, today, we spent the majority of our time remembering who God is and what He’s done just as the Psalmist did and then use that as a basis for belief in the time that is to come? With those thoughts written on our hearts, I believe our response to the unknown will tend toward Assurance and not fear…” When we’re travelling down a road for whatever reason, what do you reckon is the most important? Where we end up or how we get there? In other words- the destination; or the journey? Is it the end result that matters most; or the things you do and the people you meet along the way? This tension and figuring out the best way to approach the Christian life is the central theme to Building 429’s brand new album Live The Journey – their first in 3 years since 2015’s Unashamed – which releases at the end of this week. Lead singer Jason Roy, guitarists Jesse Garcia and Aaron Branch and drummer Michael Anderson have over the years delivered to us hit after hit after hit- songs to deepen our relationship with Christ and giving us advice as to how to walk the Christian life, while at the same time still being relevant to today’s society and personal at the same time. Songs like their smash hit “Where I Belong” as well as several other singles such as “Unashamed”, “Ocean Deep”, “Impossible”, “We Won’t Be Shaken”, “Press On”, “Listen To The Sound”, “Always”, “Fearless”, “You Carried Me” and of course their debut single “Glory Defined”- and it is these songs that form a formidable group of some of their biggest hits. Where do the songs from Live The Journey fall into? Which category does the band’s latest songs fit- every song a strong single, or every song forgettable or somewhere in between? In my opinion (and this is just my opinion mind you! ), I reckon so far you can group every single song from Live The Journey in that group as well- that group of the ‘strong singles’. Because in my opinion- I think that Live The Journey is set to be the band’s most popular and impacting album they’ve ever recorded. Yep, I said ever, and I mean it- in both Christian and mainstream markets. What Building 429 are doing with this album is something that I think no one has done in recent memory (except for maybe artists like JJ Heller and Cimorelli- correct me if I’m wrong! ), is that they have essentially released their whole album already (as of right now, the general public haven’t heard only 1 song from Live The Journey and the rest have been already released!) over the span of several weeks- one song per week. Though the only downside in my mind is that by the time the album is supposed to drop on iTunes or other digital outlets, we’d be ‘less’ excited and ‘less’ anticipated, due to our knowledge of all the songs already. However this ‘downside’ isn’t really a downside to me, as an album like Live The Journey¸ with lots of musical layers and thematical deep reflective topics explored; I believe will defy this general trend of less excitement as the days progress- in fact, I reckon this album is a must for lovers of CCM, lovers of pop, lovers of Building 429, and for those of us, especially, who have gone through a rough time, or who are going through a rough time, and are wondering whether the journey of life is worth continuing in the first place considering the hardships along the way. And I reckon life in all its facets is worth living the journey- life is full of ups and downs, but I know that God promises to be right there beside us, through it all. 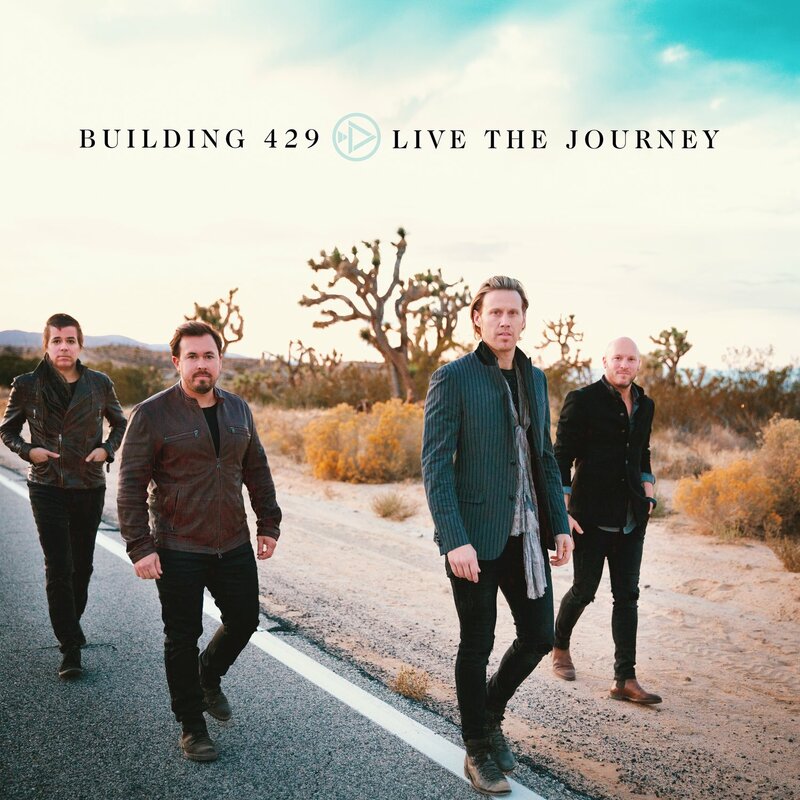 Building 429 has provided us with many a hopeful tune throughout the years and if you stop reading and go ahead and listen to the already released 9 songs from the album- it’s not too hard to see why Live The Journey has earnt a 5/5 rating for this site. But if you want to have a quick read of my thoughts on the album (including my thoughts on “Closer”, which isn’t released yet!) then take a squiz at my opinion of THE MUSICALLY, LYRICALLY and THEMATICALLY STRONGEST album of 2018! The album starts off with the first single “You Can”, which is simple lyrically but oh so very profound and very deep when you think about it. It’s a timely reminder that without God we as humans can’t really accomplish anything. As Jason ardently reiterates in the chorus, we cannot ‘…walk on the water, I can’t stand in the fire, unless I look into Your eyes, unless I have You by my side, I can’t conquer a giant or shut the mouth of a lion, I know that I am just a man, but I am in Your hands and You can…’; however Jesus can. When we can’t, He can, and that thought alone, though mind-boggling, is worth pondering over and over and over. We have limitations on ourselves for a reason, and I believe that reason is to acknowledge the areas where we need to admit we need our Father’s help, and thus surrender and give everything to God. Knowing that we can do everything, but that He can do it better; is such a freeing notion, and a notion that we can shout with joy to the world, that Jesus can do anything and everything in our lives if He wants to. Driven by stirring guitars and vibrant synth, “You Can” is a definite for WOW His 2020 (unless another single leapfrogs it in terms of popularity! ), and sure to provide healing and perspective in this tumultuous life that we are navigating. The rest of Building 429’s Journey is equally as compelling as we are met with 9 more inspiring, personal, emotional and heartfelt melodies that at least tug at my heart and are relevant for my life- and hopefully all of yours too. Pseudo-title track “The Journey” starts off with a catchy piano riff as Jason eloquently reminds us not to be so caught up on the destination and where we want to be that we miss the moments along the journey and instead find ourselves not even living at all. Similar in theme to “American Dream” from Casting Crowns, “The Journey” reassures us that in order to truly live life to the fullest, we need to step out in faith and pursue the things we want to and chase the dream that is placed in our hearts- in essence live the journey, knowing that ‘…He wants you to live with a heart that’s wide open, so you can dance like there’s nobody watching, ’cause you’ll never live it all, if you never risk the fall…’. The vulnerable piano led pop tune “Shame Doesn’t Live Here” tackles the almost taboo subject of shame, and the feelings of failure and isolation due to guilt and shame eating away at us, due to perhaps us not living up to our own expectations or others’ expectations. Failing due to our weaknesses or due to the lies the devil tells us, isn’t a pretty feeling, yet Building 429 offer up a heavenly solution in the somewhat sombre tune, that ‘…all because of the cross, I know I am free…’, while the tempo slows down a bit in the laid back electric guitar led acoustic melody “Joy Unspeakable”, as Jason delves into a notion so controversial- encouraging us to have joy unspeakable in all circumstances, yes even in our trials and tribulations and our suffering. It’s a crazy idea, but because pure joy in my opinion is based on a eternal perspective in the sense that Jesus is with us and we need not fear even if our circumstances say otherwise, rather than conditional happiness based on our feelings which change as often as the weather; having joy in the midst of suffering (which is highlighted in James 1:2-4! ), makes sense as joy isn’t dictated by circumstances but by our relationship with Jesus- Jason reminds us in this song that even if God isn’t working yet, the fact that we know that He will should provide comfort as we speak joy into our lives- even joy we’re not feeling at the moment but will someday. “1000 Promises” is a catchy 3 minute radio friendly pop tune driven by guitars, as Jason ardently highlights to us the ever true concept of God always keeping His promises, and us believing into that notion, remembering that most of the time God gives us what we need, not what we desire (in the sense that sometimes the things we ask for God are given to us in a different form or in a different time frame than we could often expect); while “I Still Believe” (no, not the smash hit Jeremy Camp song!) is a personal highlight on the album, as this in-your-face synth and strings driven pop melody opens up and stares at the face of the issue of a potential post-Christian world. Jason reminds us that during these uncertain times where many people do not ascribe to the Christian faith anymore, it is our duty as believers to unequivocally spread the gospel to those who do not know Him, proclaiming that we still believe in a God of miracles and a God of promises, because of everything we have been through and despite everything we see on the news. Because of this hard hitting and confronting question that we have been posed, I reckon “I Still Believe” would be the most difficult song to listen to, for anyone who is scared to confront the issue of faith, but that’s why I believe that it’s probably one of the most needed songs of today right now. “Always Only You” dives deep into the notion of Jesus Christ being our shelter and our refuge, our sanctuary when we need healing and a place to rest from the storm, as the piano ballad accentuates the fact that ‘…all along You’ve been reaching, all along You’ve been singing over me, all along You’ve been speaking, calling my name…’; and the album closer “Closer” (which indeed hasn’t officially released yet! ), is an out and out worship anthem through and through, as Jason passionately reiterates that as we grasp the fact that Jesus is closer to us than we could ever imagine, we can rest easy in His promises and His unending love. Yet it is the pair of “Assurance” and “The Same God” that are probably the two most personal and honest songs the band has recorded ever, and the two ONLY songs to listen to if I were to encourage you to choose only two to listen to. Assurance grows by repeated conflict, by our repeated experimental proof of the Lord’s power and goodness to save; when we have been brought very low and helped, sorely wounded and healed, cast down and raised again, have given up all hope, and been suddenly snatched from danger, and placed in safety; and when these things have been repeated to us and in us a thousand times over, we begin to learn to trust simply to the word and power of God, beyond and against appearances; and this trust, when habitual and strong, bears the name of assurance; for even assurance has degrees. The definition of the word ‘assurance’ sure is complicated though, but it is this definition by John Newton that Building 429 have based their song “Assurance” on, and a song I reckon deserves to be the second official single on Live The Journey. Using this definition in the way it is presented in the song, we are met with a prayer of confidence, a prayer of actually knowing that what God says He does, He will do. Not that we know from actual evidence- because sometimes God acts in His timing and not in ours- but we know that we have assurance in Jesus because of everything He has done in the past. Countless miracles that have been true in the past remind us that He is faithful in the future, and everything that occurs in the here and now is sure to shape us as believers now and into the future. We may long for God to act, but even if He doesn’t right away, promises in the Bible encourages us to keep on believing because of our assurance. “…Let me share a bit of hope with you: YOU MATTER! Your church matters. Your small Sunday school room filled with outdated posters, matters. Your testimony matters. But what matters most is when you choose to give yourself away. You’ve been given so many tools to love others with that, it’s insane if you don’t use them. Until you start trying to use your resources to bless others, you will feel completely bankrupt just the way that I did. In my travels, I have come to one conclusion that is inescapable, but I would’ve never come to this conclusion if I hadn’t been willing to risk being a fool, to risk being uncomfortable, to risk giving something away. After all that I have seen, He’s still the same God to me and is the also the same God to you!…” “The Same God”, not as musically impacting as other tracks on the album, but nonetheless enjoyable, really takes the band to another level in the personal and relatable lyrics, given that the song is based on Jason’s life and how he deepened his relationship with Jesus after his parents divorced. Autobiographical and a testimony of God’s faithfulness and providence, we are met with probably the most vulnerable song Jason has ever written, as he declares that the same God who was with him when he was a kid is still the same God now, regardless of everything that has occurred during the years in between. And the beauty is that this song “The Same God” can be taken by each one of us, as anthems and testimonies for ourselves, as we claim the notion that Jesus is the same yesterday, today and forever. It’s a statement for today, and for tomorrow as well. Well done Jason, Michael, Jesse and Aaron, for 10 compelling and emotional and heartfelt melodies that will stay in my heart for a long time, and will definitely be on rotation on my iTunes for a long time as well. This Friday can’t come soon enough! Though “This Place” unfortunately did not make the cut for the album, there are still other compelling tracks on Live The Journey (“Assurance”, “The Same God”, “I Still Believe” and “Joy Unspeakable”!) that inspire us to press on and keep going, pushing through the pain barrier even when it’s hard. So as we wait for Jason Roy and his friends to unveil 1 more ‘new’ song to finish up living their journey of making this new album (see what I did there!) when it actually officially releases this Friday, and to encourage us to keep on living our journey, or start living if we haven’t already; why don’t we take a good look at our lives, and ask ourselves if we’re being real with those around us, or are we just living from day to day and putting up a front for others to see? If so, why are we scared? With the album containing plenty of tracks that are confronting, yet also comforting, I expect Live The Journey to be big, in all music markets. Nothing less, because how could you not jam to and reflect upon these songs of biblical and eternal truth? So what are you waiting for? Press play on Spotify (or your choice of streaming device!) and live the journey! Oh, and read all of Building 429’s devotionals on each of the songs here as well- they’re pretty inspiring! Previous PostStan Walker – Stan EPNext PostFLASHBACK FRIDAYS: WEEK 23 (Come to the Well by Casting Crowns)- What satisfies us more- water or Jesus?